Before moving to Paso Robles, Jan and I moved all of two miles up to Pismo Beach North State Park. Our site allows us to walk a short ways to catch the beach and the sunsets. Another short walk takes us to the Monarch Butterfly Grove attached to the park. The prime season for the monarchs is October through February, but we had multiple monarchs every day at our site and still about fifty in the grove which is relatively small. The grove is mostly large eucalyptus trees which provide a protective canopy for the 25,000 or so monarchs that gather over the winter. This is the biggest wintering spot for monarchs west of the Rockies. East of the mountains, the monarchs winter in Mexico. 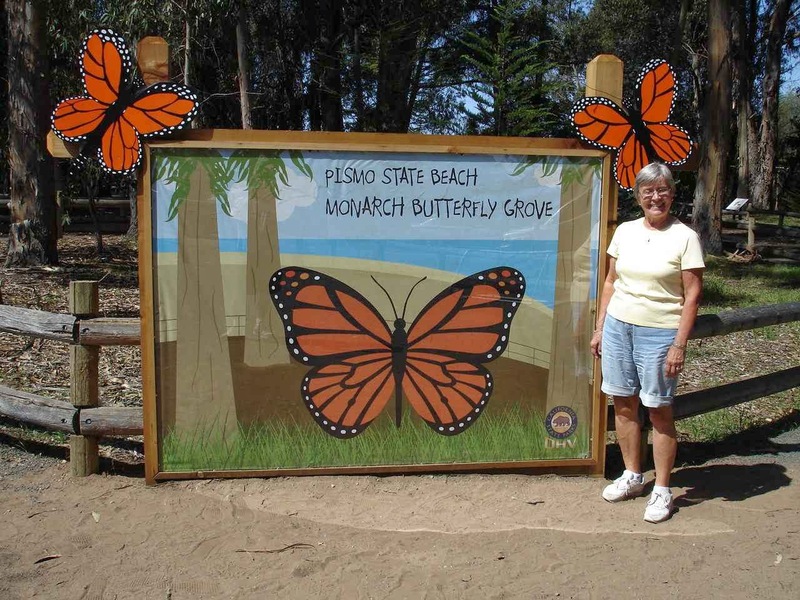 The grove has an interesting website with other pictures and monarch information. http://www.monarchbutterfly.org/ . You will also see a good aerial picture of Pismo Beach. 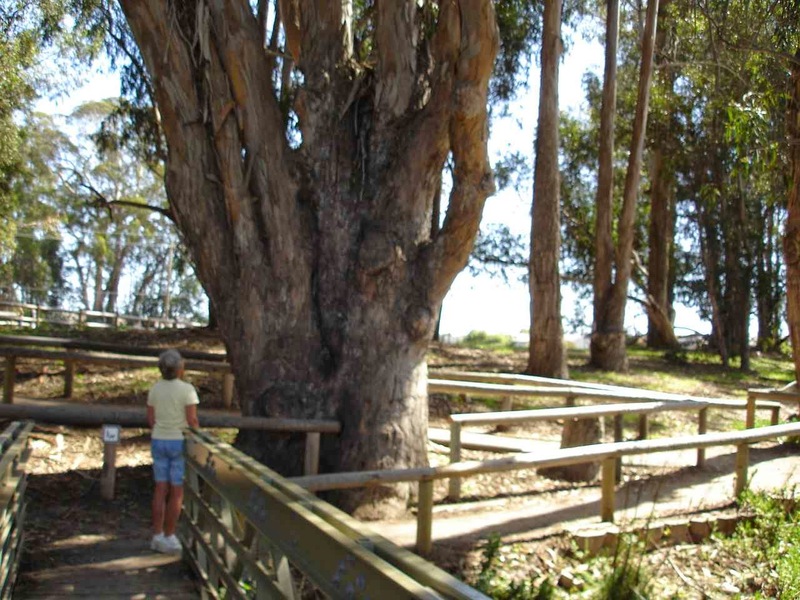 The eucalyptus trees are not native (from Australia), but they provide a distinct scent, especially on warm days. The monarch butterflies feed on the blossoms of other plants. The eucalyptus trees are for warmth in the winter. The canopy gives good protection from the wind and cold. If you were wondering, like we were, the monarch caterpillars are the ones that need the milkweed for food. Another nice thing about this campground was that we could walk to the main beach and the Pismo Pier. 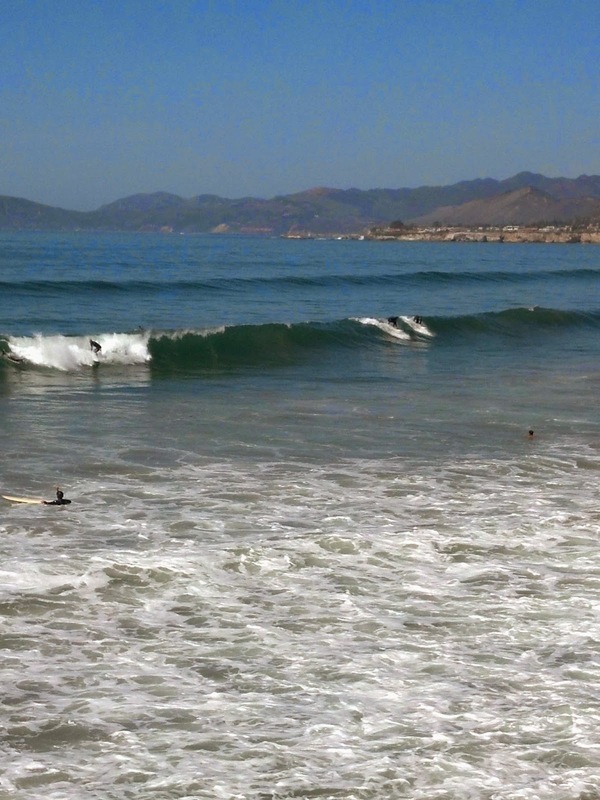 The waves were high this day--12 feet or more--and there were many surfers taking advantage. Interestingly, most of the surfers were older--20's, 30's and a few older than that. Not so many teens. A few were able to do great turns and take long rides into shore. By the way, if there are future visits in store for some of you, you may want to remember that fishing from the pier does not require a license. 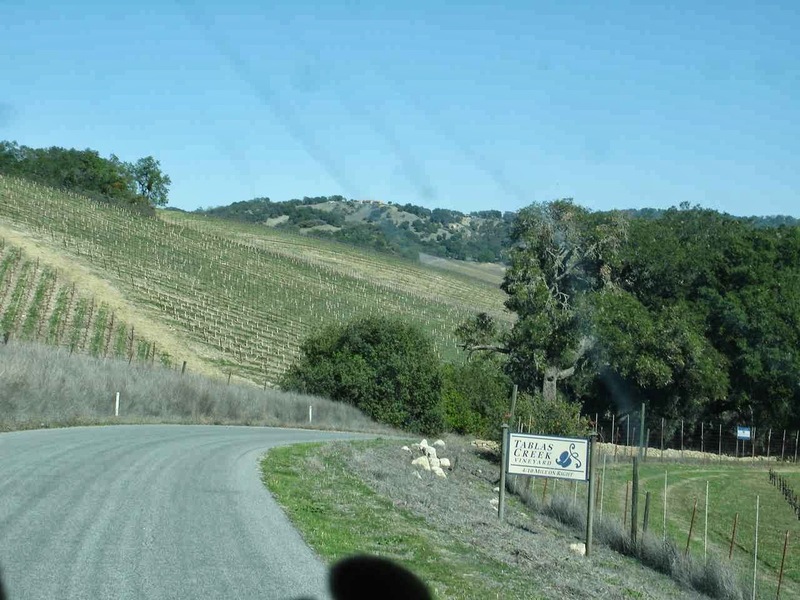 There are many roads to travel through Paso Robles wine country. Actually, there are many wine growing regions within California and many tours and travel roads in each one. 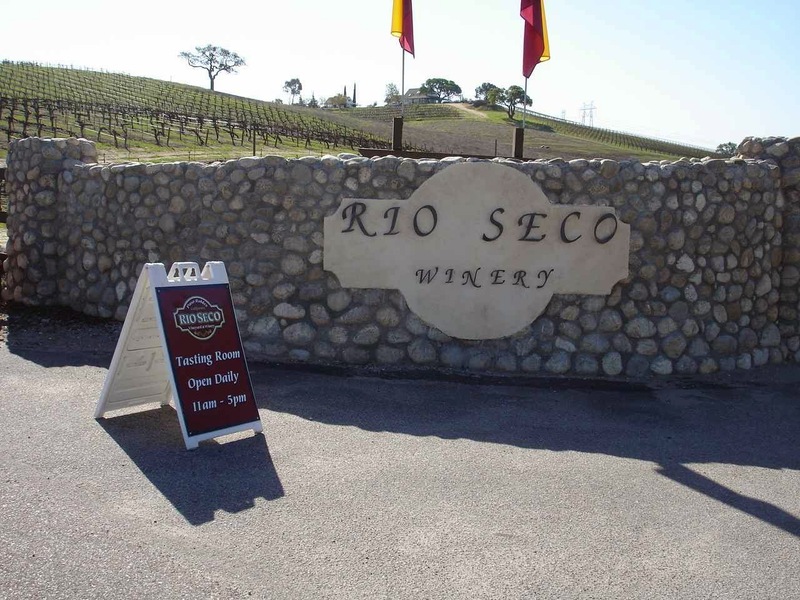 Rio Seco Winery is another one of our Harvest Hosts. Carol, the owner, and her family were so very gracious and welcoming. They made us feel right at home and told us we were welcome to stay as long as we liked. The entrance gives an idea of what a comfortable vineyard this is. Carol and her husband started this in the early 90's. There were a handful of vineyards then in Paso Robles. In a few years , in the mid 90's they were licensed for their first sales and have a wine "22", to indicate their number for the new winery. Now there are more than 250 vineyards just in the Paso Robles area. We had waited till after the weekend to come here because Rio Seco was hosting a large party of about 250 people on Friday night as part of the Zinfandel Festival. 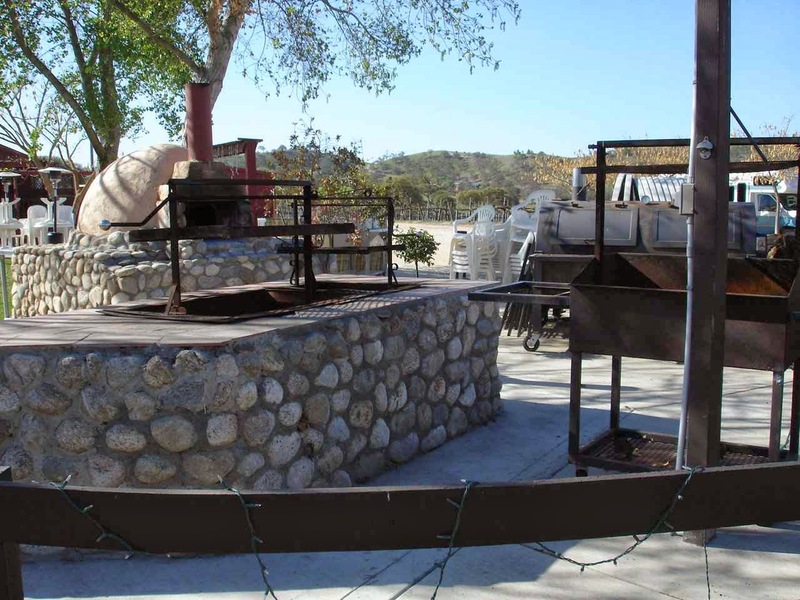 As you can see here, they have a small , but comfortable patio with all kinds of cooking gear from a beehive oven in back to smokers, to barbecue pits and grills. This is a guest house on the property. The roses in the front were beautiful. 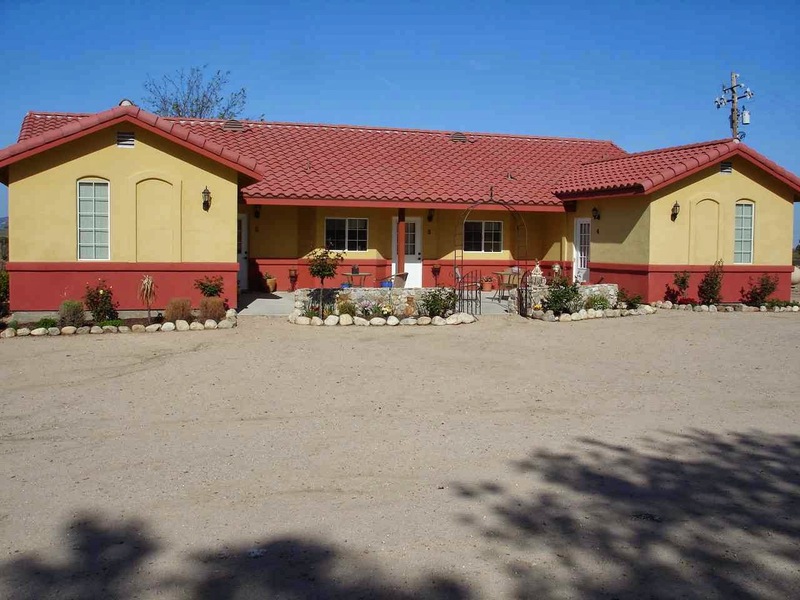 There are patios in the front and back of the house with long views of the mountains and vineyards. Such a pleasant perch for Lady Blue! We tried and purchased some Cabernet Franc, Syrah, and an unfiltered Zinfandel 2006 that we enjoyed very much. 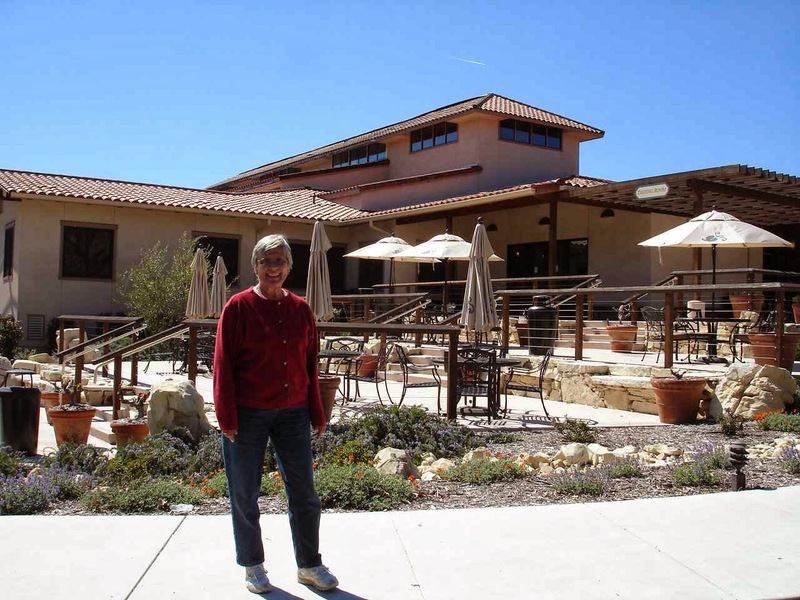 For any of you who are Harvest Host members, Jan and I strongly recommend a visit to Rio Seco. 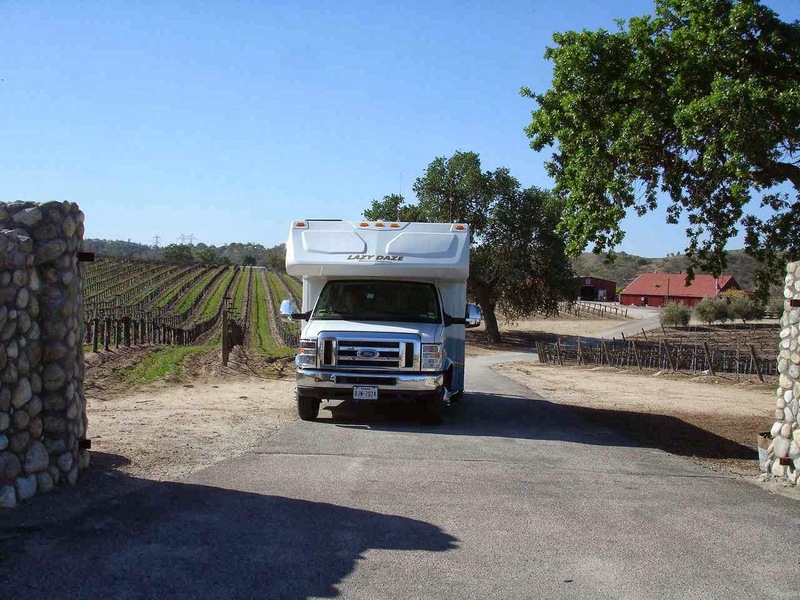 It would take a long time to visit all the wineries and vineyards in Paso Robles, but we had some good recommendations from Scott and Rachel who had visited here before. First up was Tablas Creek. We looked forward to the tastings. The vineyards were quiet after the weekend and we could ask all kinds of questions about the grapes, the vineyard, the area, and , of course, the situation about the water supply. 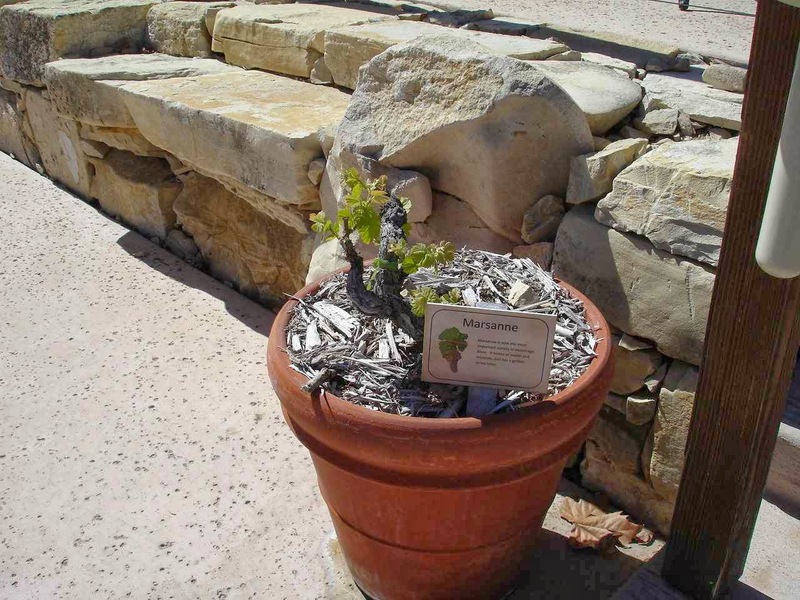 All around the Tablas Creek patio were planters of grapes, all labeled. Our wine tasting host indicated that all of the vines in Tablas originate from France. Some are related back to Chateauneuf-du-Pape. They were told by French vintners that the weather here in Paso Robles was even better than the weather in France. The road from Paso Robles to Tablas Creek and Justin wineries was worth the trip all by itself. A narrow, winding country road that at times would be right at home in New England( if you added maybe a few stone walls). The entrance to Justin Winery reminds us a little of a Greek or a Mediterranean look. Again , our host for the tasting was very pleasant with a lot of information as a native of the area. They also were quite busy over the weekend. But, we were lucky. They had an opened bottle of $100 Focus Syrah and added it to our tasting samples. The wineries were nice, we were able to do a tasting, and like here at Justin, were able to purchase a bottle--not the $100 one--and have the tasting be free and also have a labeled wine glass as a gift. 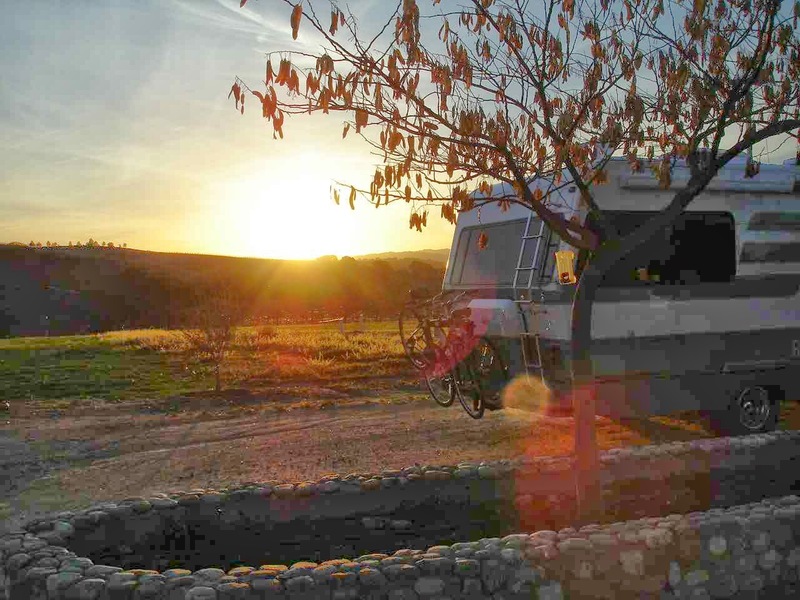 We could have stayed longer in Paso Robles. The town itself was quite inviting. But off we go to Sequoia National Park. As we approach the area, what we thought were clouds on the horizon become snow capped mountains. 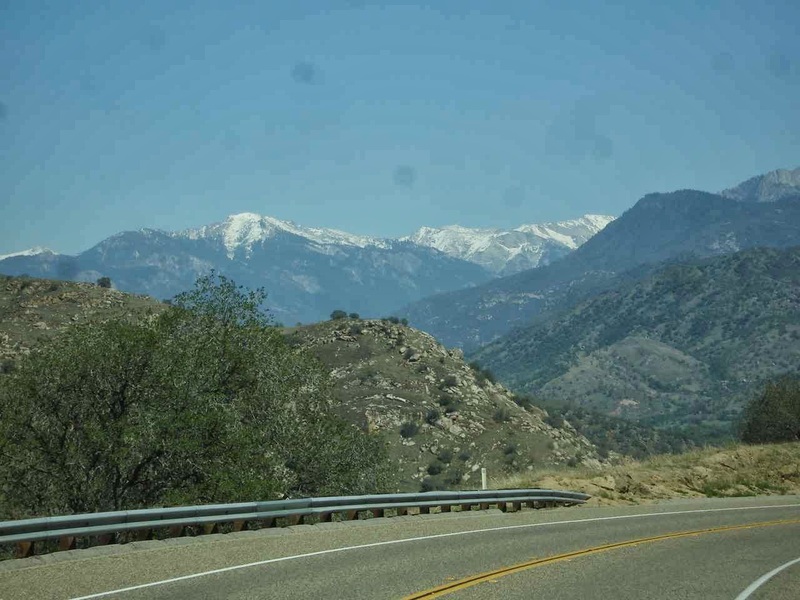 These peaks are part of the Sierra Nevada Mountains. One of these peaks is Alta Peak at 11,204 feet. Out of sight on the other side of the mountains is Mt, Whitney, almost directly east of here. Mt. Whitney is the highest point in the lower 48 states at 14,494 feet. Marsha and Mark climbed Mt. Whitney--a few years ago--and Jan and I are quick to be impressed just seeing these peaks. Just ten miles from the south entrance in Three Rivers is Horse Creek Corps of Engineer Campground. 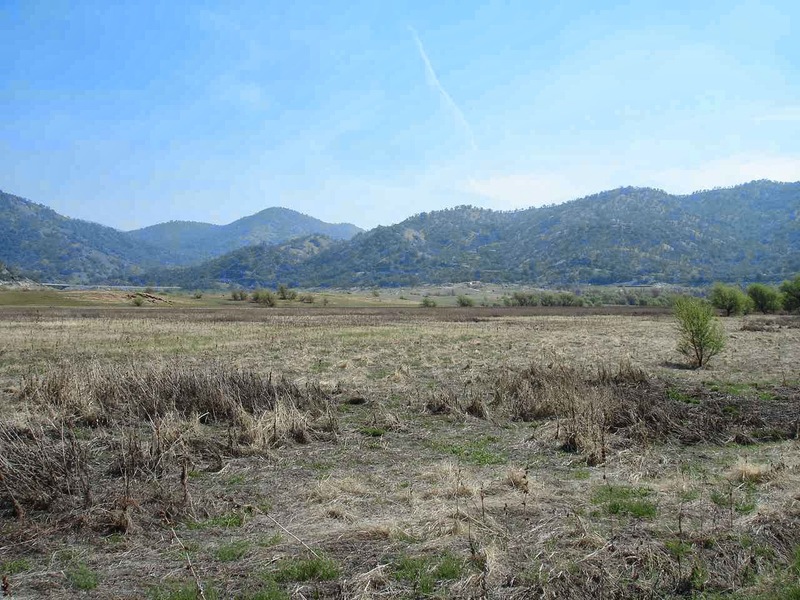 The water in the distance is Lake Kaweah which, in a better year, would be right into the park itself in the Spring. Notice the crowd around Lady Blue? This is dry camping , but there is water available in the park and a dump station as well. Our senior pass allows us to enjoy this view for $10 per night. Since we are waiting for mail to arrive, we decide to stay through the weekend. We have researched Sequoia online, but we have some questions about the roads. This will be a visit to the Visitors Center and a quick look around. 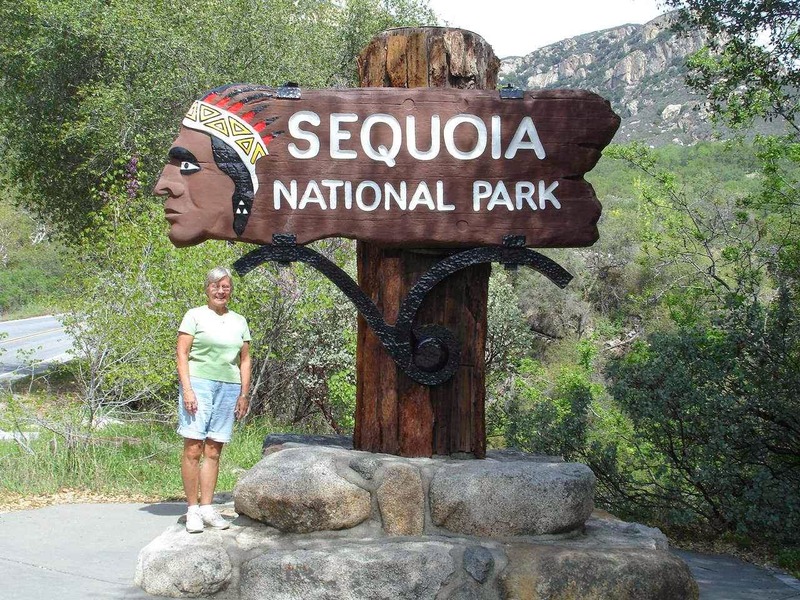 Jan and I are happy to have a very pleasant ranger give us all kinds of information about Sequoia and Kings Canyon parks. 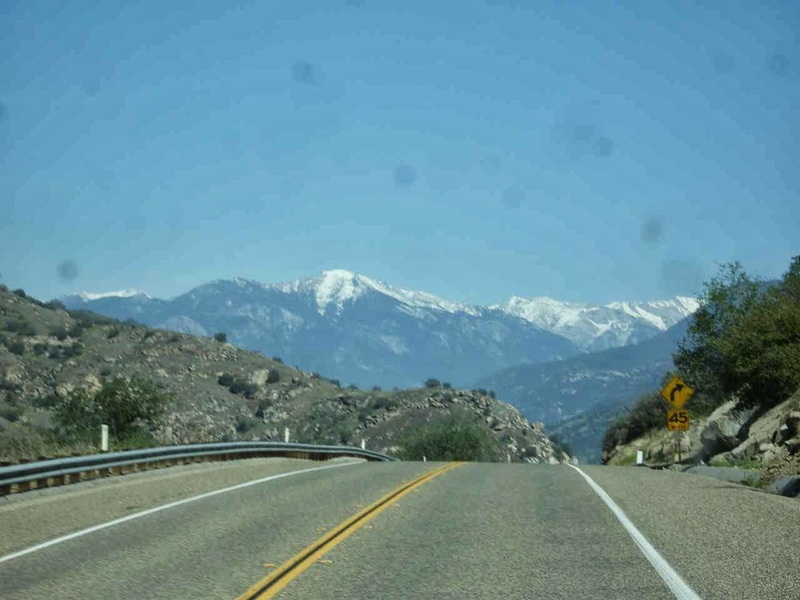 Although we could drive all the way up through Sequoia, it seems best for us to head to the north entrance after this leisurely look at the first few miles and a little hike. The recommended length for RVs in this lower section of Sequoia Park is 22 feet or less. 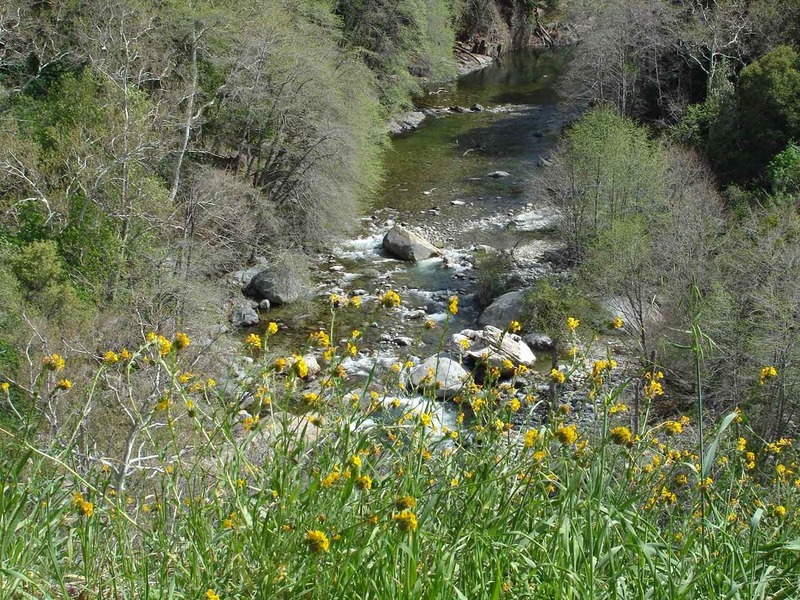 All the views are wonderful and the water you see is from one of the branches of the Kaweah river. This is the foothills area. Giant Sequoias need 5,000 feet elevation or higher. This panorama shot gives a little idea of the landscape in this section. We walked down to the Buckeye Flats campground from the Hospital Rock picnic area. The campground is not open yet and is for tenters. The river was flowing quite well even for a runoff in a low snow spring. This picture shows the river quite a few feet below us. From above we could tell that there were a number of pools of deep water , perhaps six feet or more. And the water was crystal clear right to the bottom. Back at the Hospital Rock picnic area, there are signs left from the Indian village. 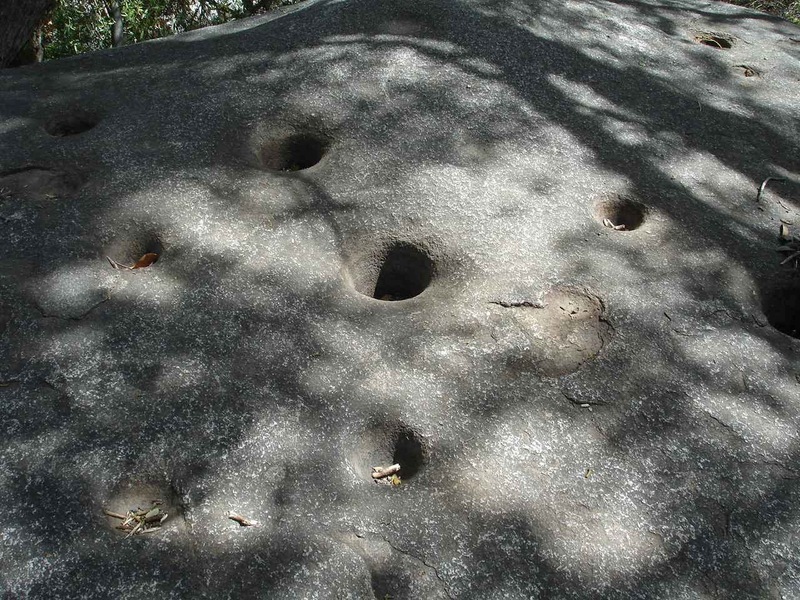 This large rock has many shallow to deep holes that were used with stone pestles for grinding acorns and such. 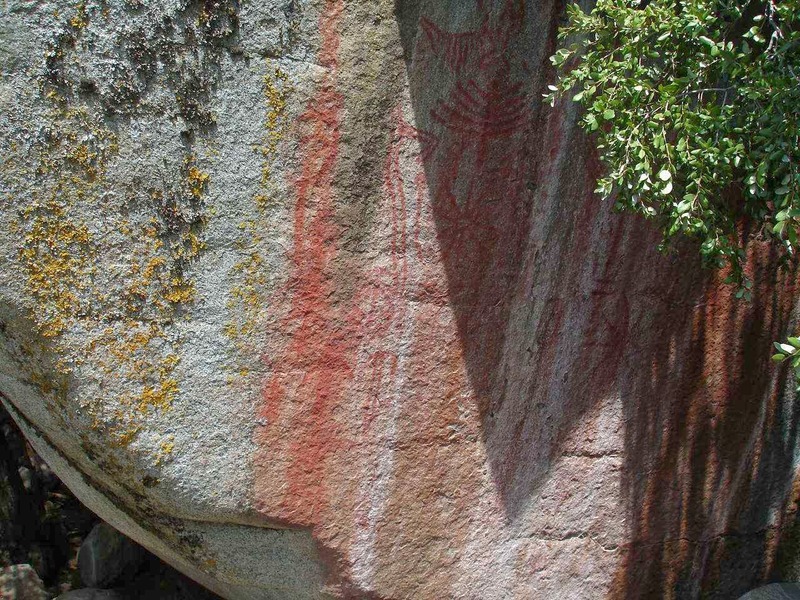 On the rock itself are pictographs from the Native American settlement. There were a number of groups of Native Americans in the Sierras with settlements back thousands of years. A common sign in the area. 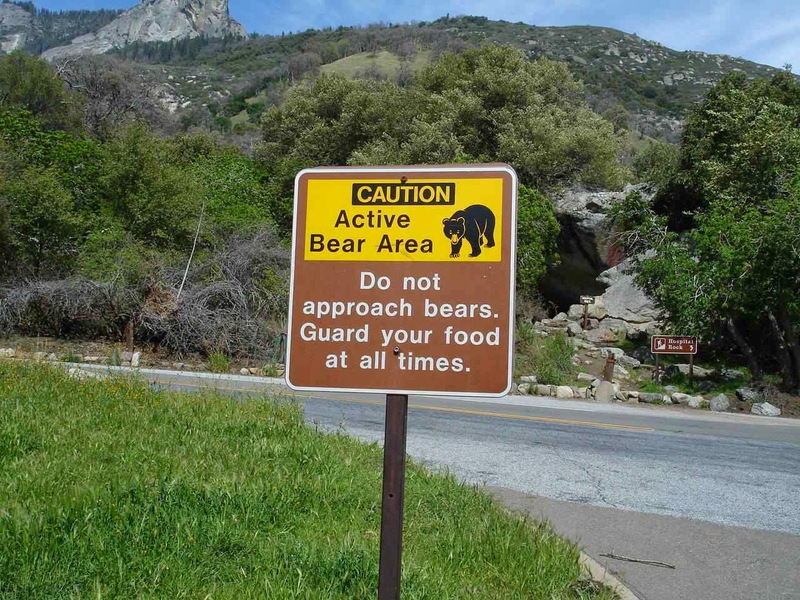 There are also a number of signs about what to do if you meet a bear, a mountain lion, or a rattle snake. Luckily, one of them is " make a lot of noise". Interesting, for the mountain lion, it included "fight back"
First, Bruce checked to see that this Tunnel Rock was well supported. Yep! 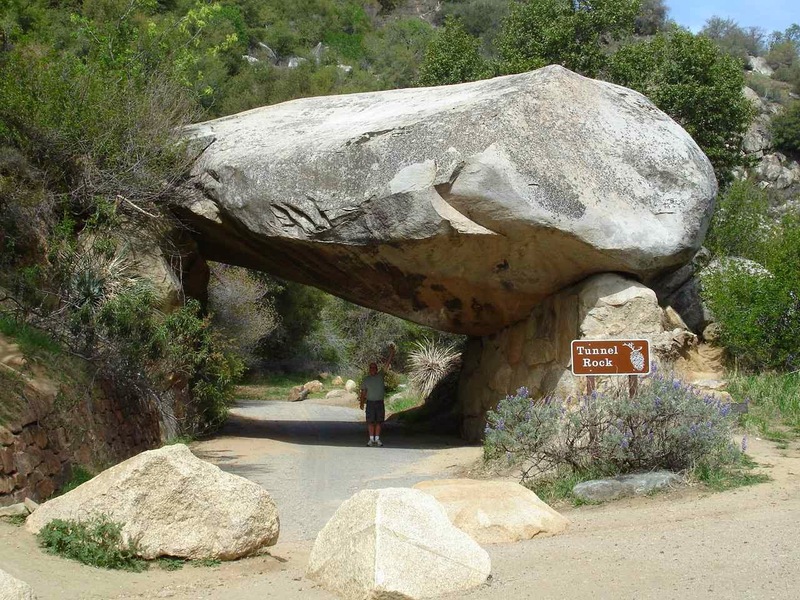 The road surface indicates that cars used to pass under this rock at one time. 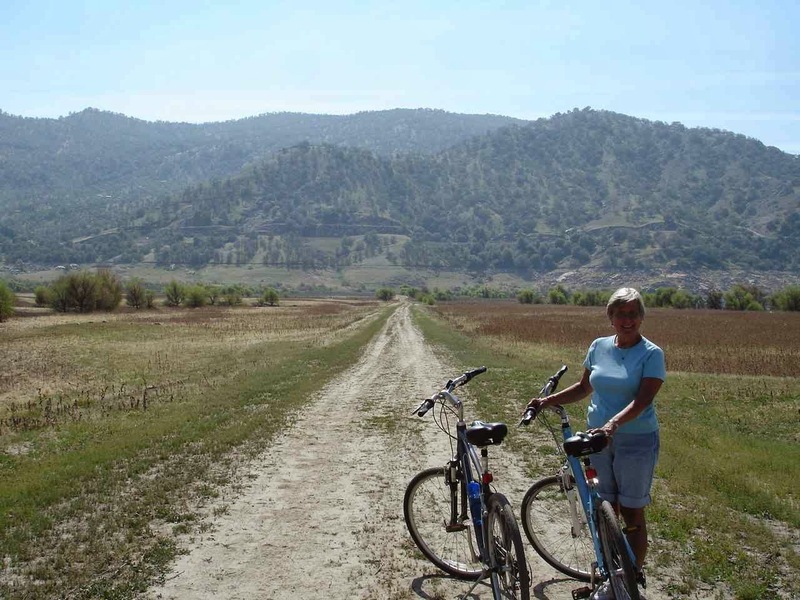 From our campsite, we can ride our bikes to the river and around the area. 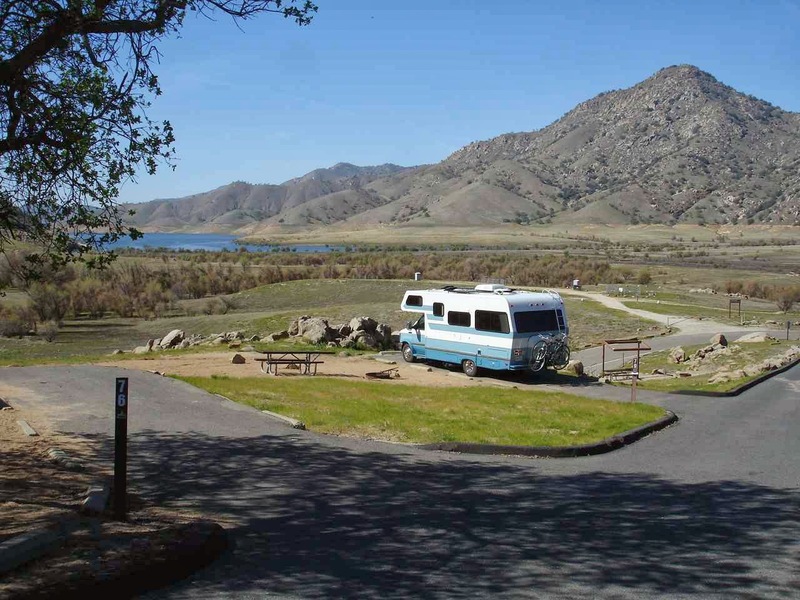 A number of fishermen are taking advantage of Lake Kaweah. Looking back from our bike road up to our campsite. Can you see Lady Blue? Enjoying this spot for the weekend and then up to the north entrance. That will be our first sighting of a Giant Sequoia tree. We really enjoy reading your blog. 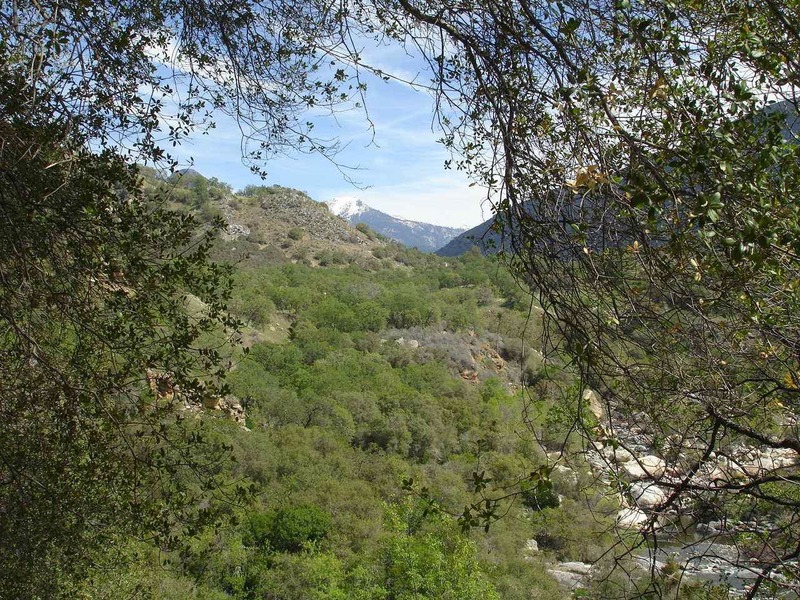 We toured Sequoia/Kings Canyon right after picking up our '08 Lazy Daze. The trees are beyond description. We went and ordered a 2015 TK. Seems to be a perfect size for touring without a Toad. Should pick it up next April+-.